This corporate mini women leather dress is crafted from lambskin leather. This leather dress is the really cool styled daytime leather dress for women. A complete am to pm styled women leather outfit. This women leather dress is mini styled high neck outfit with long sleeves and back zipper fastening outfit. 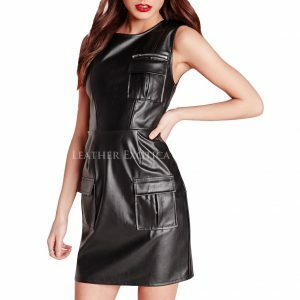 Make your style more amazing and awesome with this leather dress. Grab this women leather dress today and make your style amazing.